VANCOUVER, BC – The Winter 2018 issue of What’s Brewing – a quarterly publication subtitled “The Journal of BC’s Craft Beer Movement” – is now available. 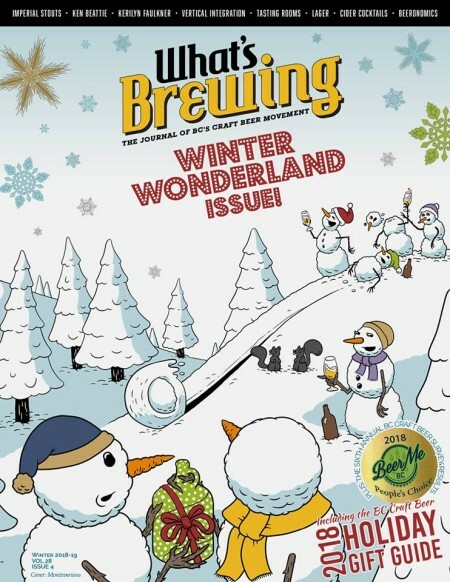 Contents of the issue include the results of the 2018 Beer Me BC People’s Choice Awards, profiles of BC Craft Brewers Guild Executive Director Ken Beattie and Torchlight Brewing‘s Kerilyn Faulkner, the 2nd annual BC Craft Beer Holiday Gift Guide, and much more. The new issue of What’s Brewing can be read online via the Issuu e-magazine platform, or downloaded as a PDF for offline reading. A limited number of printed copies are available via subscription, and at breweries and other beer establishments throughout British Columbia.